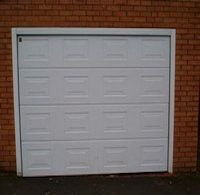 Suitable for Residential Property, Shop Fronts, Commercial Premises, Industrial and Warehouses. Manual or Electrically Operated; Available Switched or Remote Controlled. Finishes - Galvanised, Plastic Coated and Powder Coated. 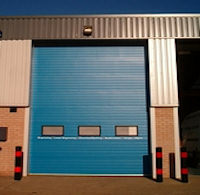 Fire Rated Roller Shutter Doors Available. Made of Insulated Steel Clad Panels. Solid or Glazed Panels. Manual, Chain or Electrically Operated with Remote Control or Switch Controlled. 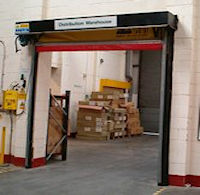 Suitable for Commercial Premises and Warehouses. Available in Plastic, Aluminum and Steel. Electrically Switch Operated, Remote Controlled or by Sensors. 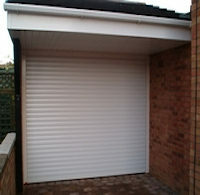 Types - Up & Over, Roller Shutter, Sliding, Sectional and Hinged. Can be either Manual or Electric with Remote Control. Finishes - Plastic Coated, Powder Coated, Wood Grain Effect and Natural Timber. 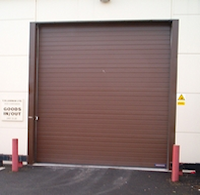 Suitable for Residential Property, Commercial Premises and Warehouses. Used for Fire Exits, or Security. Finishes - Plastic Coated, Powder Coated and Wood Grain Effect. Available in Timber, UPVC, Steel and Aluminum. Finish - According to the material they are made of. Shop Front Doors and Frames ~ Aluminium, UPVC and Timber. Finish - According to the material they are made from. Bar Doors and Grills ~ Steel and Aluminium. 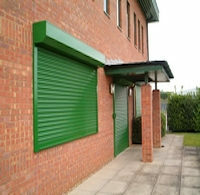 Roller Shutter and Sliding. Finish - Powder Coated. Strip Curtains and Hinged Curtains ~ Made of tough plastic. Gates and Barriers ~ Manual or Automatic. Made of steel with coated finishes. Bollards and Security Posts ~ Made of steel with various finishes. 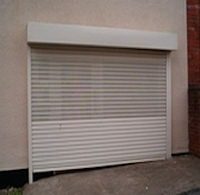 Retractable and Fixed Grills ~ For residential and commercial premises. Made of steel with powder coated or brushed finish. Door access control systems and additional security systems. Steel sheets to cover doors and windows in vacant buildings. Steel Fence Panels ~ For site boundaries. Temporary or Permanent. Spare Parts ~ Available for all doors and equipment.